I was graciously invited by Chinesebites to attend and sample some of the food stands for free at the International Night Market located on Vulcan Way in Richmond. My boyfriend and I went on an eating adventure around the food stands with other attendees Elaine and Jeanine. For the most part, we shared and sampled a variety of foods. Let’s just say some stands definitely stood out to me more than the others. 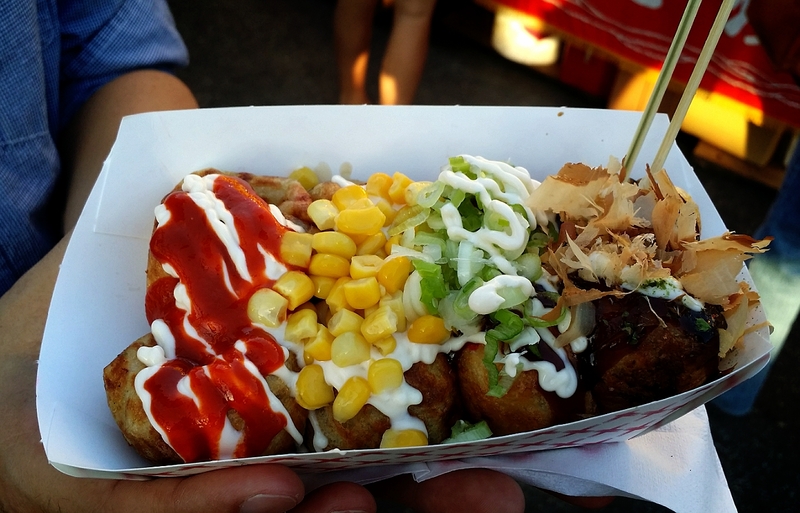 The octopus sampler from Hatchan Tako Yaki featured a variety of takoyakis, including corn mayo, hot mayo, negi shio, and shoyu. They looked super delicious and appealing in photos, but they were generally not very good. 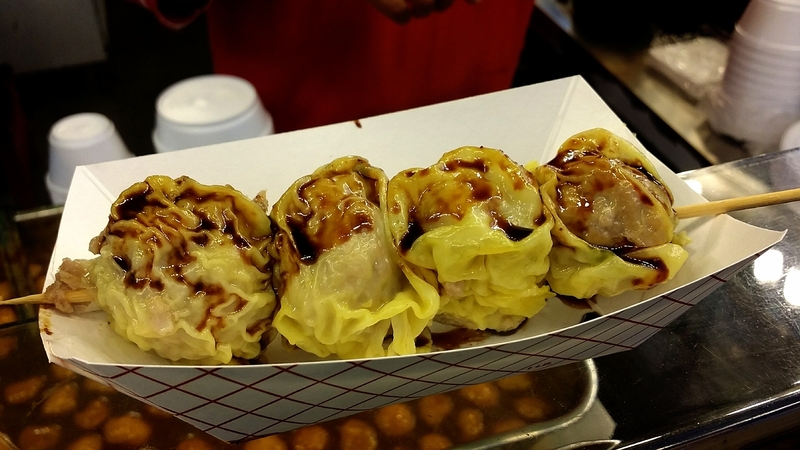 They were quite disappointing as the takoyakis were undercooked and too mushy inside. 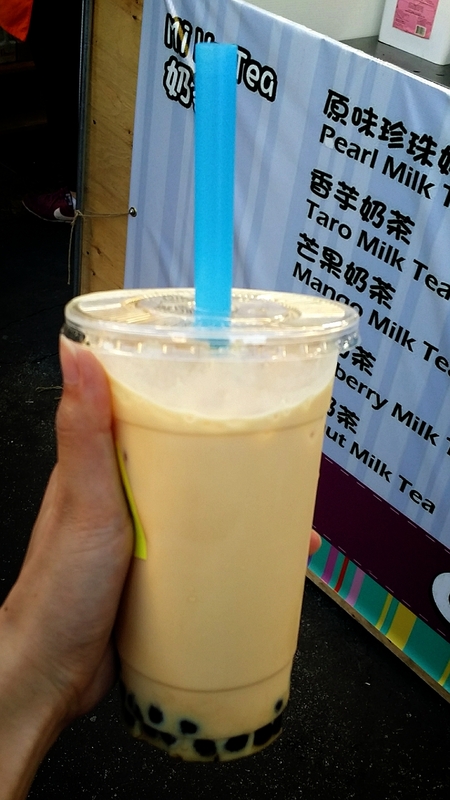 My boyfriend and I shared a mango milk tea with pearls from Orr Street. The drink was sweeter than I would have liked. However, it was a great thirst quencher. 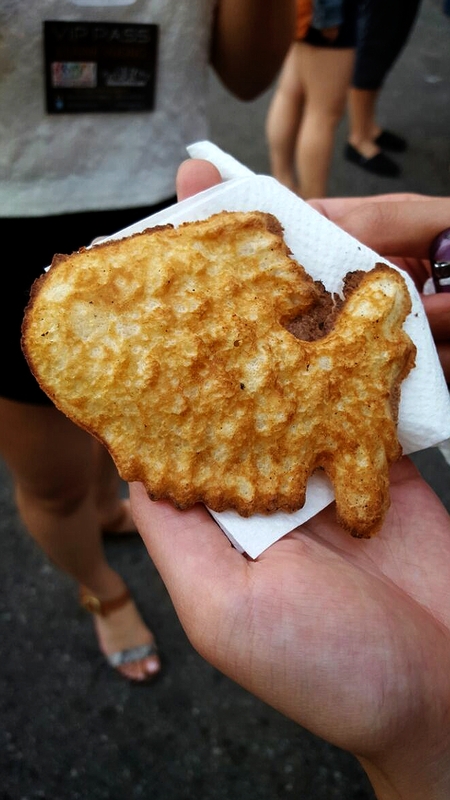 The stand that we thought was worth trying was the Chicken’s Breading. 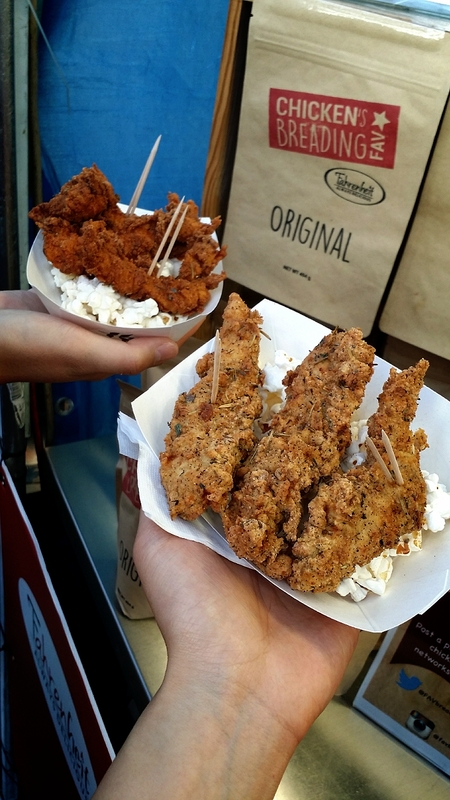 The chicken strips were served on top of a bed of popcorn underneath. They were big, very tender and juicy to eat. The breading was made with natural blended spices that were easy to see on the coating. We ordered one spicy and one regular. We all preferred the spicy version more as it was tastier and had a slight heat to it! 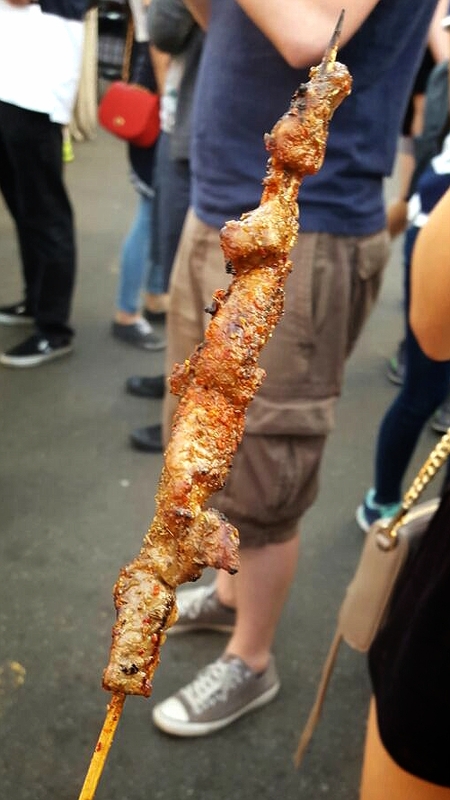 I personally love lamb skewers so we ordered a few from Halal BBQ. The meat had great taste to it and was perfectly marinated with spices and sauce. The lamb meat was also very tender to eat and chew on. You definitely cannot go wrong with trying out this stand. 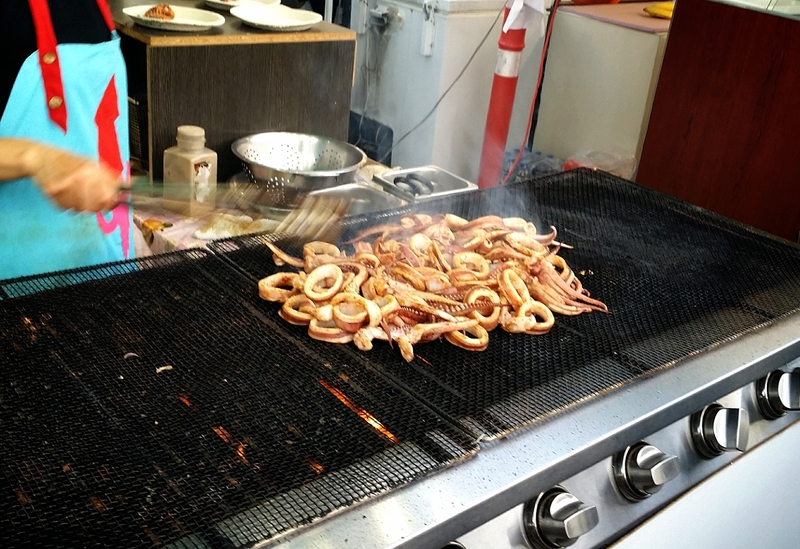 The squids from BBQ Squid were massive, making them hard to eat and got very messy. They were too chewy and not enough bbq flavouring. 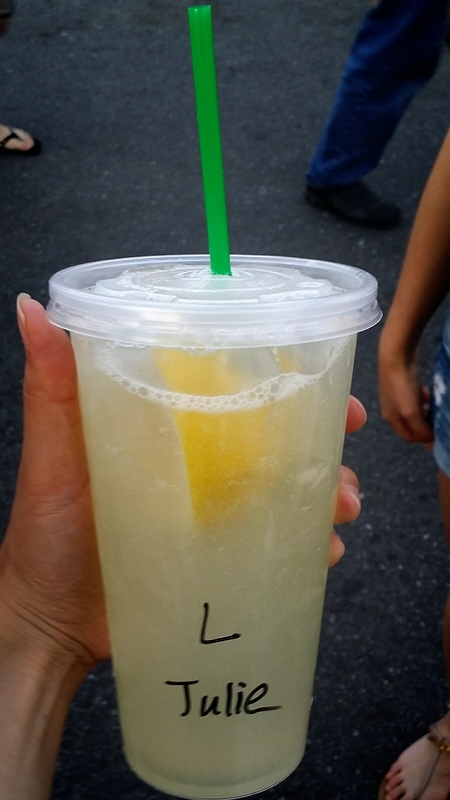 We also ordered a large size lemonade from Freshly Squeezed Lemonade. If only it was a little sweeter, I would have enjoyed it more. Next we ordered a few custard and red bean fish cakes from Korean Waffles. I definitely liked the creaminess of the custard filling more. I could not leave without getting myself some curry fish balls and siu mai from Top Wok as well. They tasted the same as most places. Also, the powdered ketchup hurricane potato fries that we ordered from Long Hurricane Potato Fries were very addicting to eat! The potato fries were coated fairly evenly and the ketchup flavour mixed very well with them. 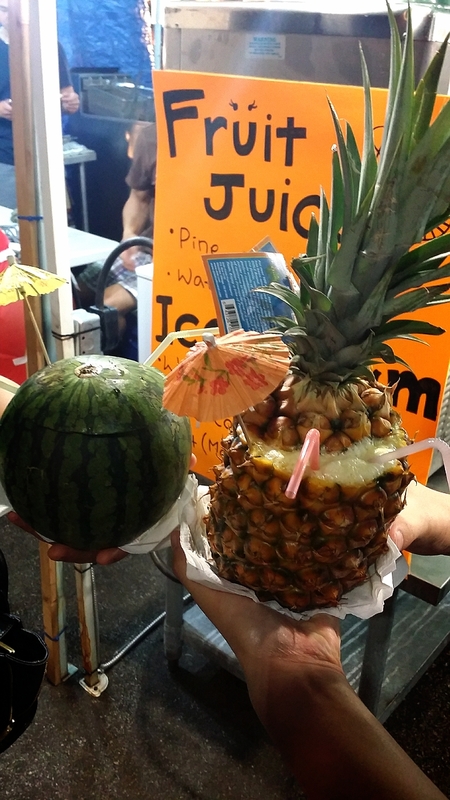 We got ourselves a watermelon and pineapple drinks to share from All About Ice-cream. I enjoyed the pineapple drink more as it was so refreshing and sweet compared to the watermelon drink which was not as sweet unfortunately. 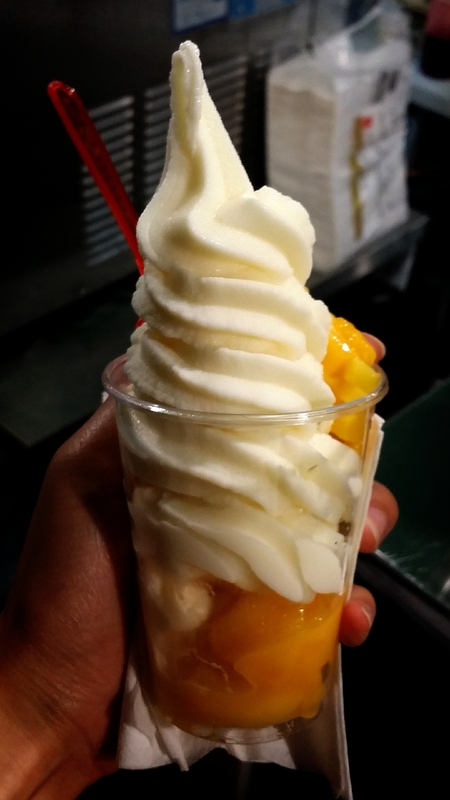 I was curious about their soft serve ice-cream so I ordered one with mango topping as well. The texture of the ice-cream was not smooth, but rather very icy. I would definitely not pay for this. 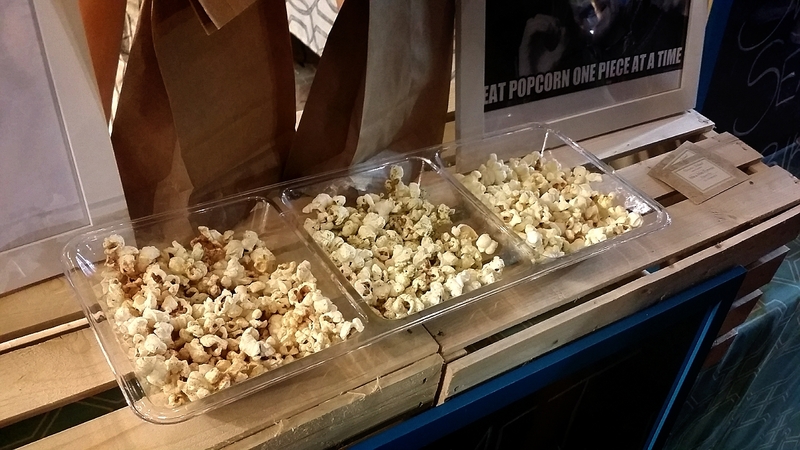 Lastly, I felt that the popcorn from Mr. & Mrs. Poppins Popcorn Bar was too oily and not very fresh. The flavours were not very unique in my opinion, but I did try the seaweed one and I thought it was just okay. 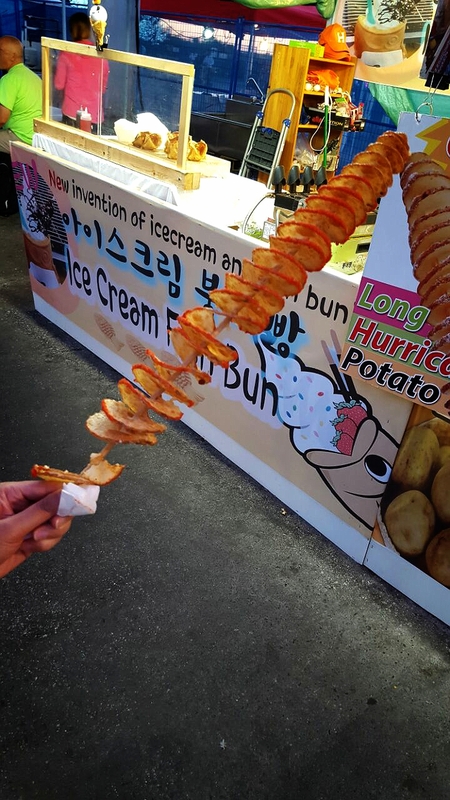 There are definitely some decent food stands at this night market that are very well worth trying. If you do not like big crowds or long line ups, this location can be an option as some food stands may catch you off guard! Also, there is free entrance again this year!